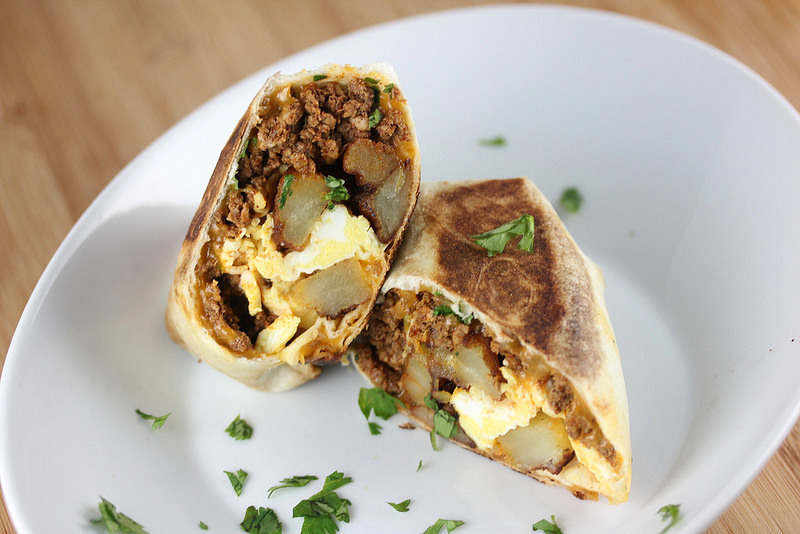 We love chorizo in my household—especially this recipe for homemade Chorizo Breakfast Burritos. If don’t like spicy food, there is no need to worry—this homemade chorizo recipe is much more mild than the kind you can purchase in the store. The combination of flavors and textures from the egg, chorizo, potatoes, cheese, and salsa make it super delicious and a hit for any crowd. We like to lightly brown the burrito once finished in the skillet, but this is not necessary. From Cully’s Kitchen to yours! (FOR CHORIZO) Mix together chili powder, paprika, cumin, salt, garlic powder, coriander, oregano, red pepper flakes, cloves, and pepper in a large bowl. Add apple cider vinegar and stir until dried ingredients are saturated. Using your hands, add the ground pork and work the spice mixture into the pork. Preheat oven to 300 degrees F. Add 2 tsp of the olive oil to a large skillet and warm on medium-high heat. Add potatoes and cook until browned on all sides, occasionally flipping them (about 5-10 minutes). Put potatoes into a large bowl and set aside. Add Chorizo to the skillet and brown the meat, breaking it up into small pieces. Heat until meat it fully cooked, about 10 minutes. Add to bowl of potatoes and mix; keep warm. Put the tortillas on an oven-safe plate and place into oven to warm. Whisk eggs in a bowl and season with salt and pepper. On low heat, add the remaining 2 tsp of olive oil into the skillet. Pour the egg mixture into the skillet and scramble. Take the tortillas out of the oven and construct burritos. Split the eggs, chorizo, potatoes, salsa, and Monterey jack cheese on the tortillas and roll. (Tip: place ingredients in the center of the tortilla, fold in the shorter ends, and roll from the bottom).